MUSE light up Ricoh Arena; Stadium not on fire. MUSE set The Ricoh Arena alight on Monday, causing panic amongst Twitter users. 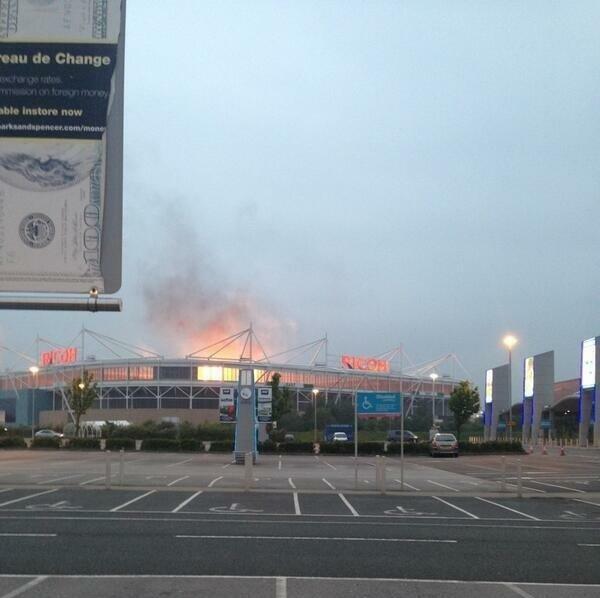 Rock band MUSE sent Twitter and Coventry City fans into frenzy on Monday, when it appeared The Ricoh Arena had been set alight. With all of the confusion around the ground and whether the Sky Blues will actually be playing their home games the ground next season, many fans were left wondering the legitimacy of the blaze; some speculating it was Coventry City’s owners making life a little easier in terms of finding land to build a new ground on, but in reality MUSE were just sound-checking and testing the pyrotechnics ahead of their upcoming concert. It did however get The Ricoh Arena ‘trending’ on Twitter and had many, including ex-professionals Robbie Savage and Stan Collymore, tweeting and speculating about the supposed blaze. « Coventry Telegraph campaign hits 10,000 signatures, but still needs more.